The new EG250 is a straightforward twin-blade edger, designed to be affordable and reliable with simple edging functions. 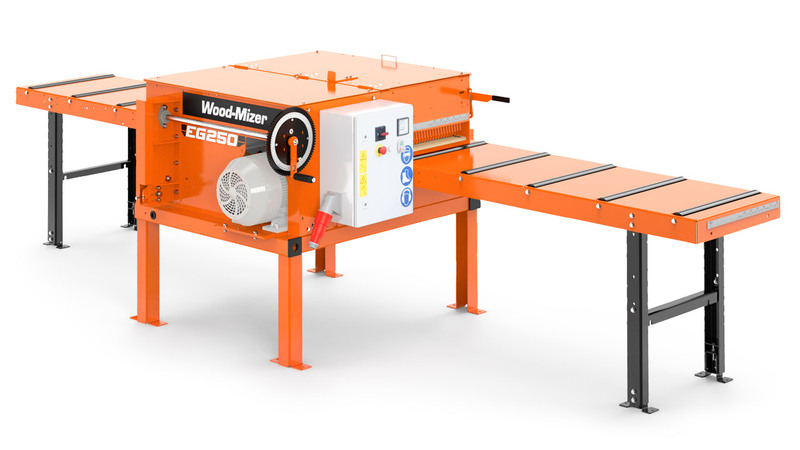 For woodworking shops looking for a dependable edger, but not requiring industrial-grade productivity features, the EG250 twin-blade board edger is a new solution. The edger is supplied with two circular sawblades, powered by an 11kW motor, or optionally a 15kW motor. One blade is fixed and the other is adjusted using a hand crank to change the edging width. The edger’s power feed system comes standard at 12 metres per minute, but a variable speed option can be added to allow from 0 to 20 m per minute. For boards that already have one straight edge, an adjustable fence allows the operator to quickly position boards for edging the second side. One fixed circular blade, and an adjustable blade for changing the width of the cut. Lets you accurately choose the final size of lumber you want when edging. Full width steel rollers grip wet boards firmly without damaging the surface. Allows you to quickly position boards that already have one straight edge.